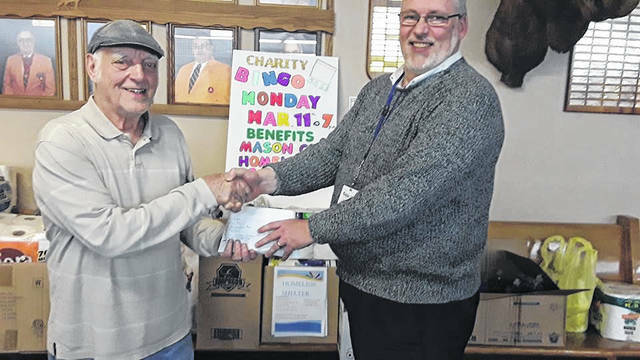 Pictured are, from left, Ray Armentrout of the lodge giving John Machir, housing director of the Mason County Homeless Shelter and Simms housing, the profits from a recent charity bingo. Pictured are various items inside the Mason County Baby Pantry. The baby pantry is open every month on the second Monday from noon-2 p.m. and on the fourth Monday from 5-7 p.m. as well as in any emergency situation anytime. POINT PLEASANT — The Mason County Baby Pantry is a local organization which helps mommies-to-be and mommies-in-need, providing them with multiple baby necessities. On Monday, April 8, a special bingo night will be held for the Mason County Baby Pantry at the Point Pleasant Moose Lodge 731. The doors of the lodge will open at 5 p.m. and the games will begin at 7 p.m. Admission is free and there will be a cash drawing. Concessions will be available for purchase. All ages are welcome to attend this family friendly event, but individuals must be at least 18 years old to participate in the bingo games. Those who are planning to attend may also bring donations for the baby pantry such as diapers (sizes 3, 4, 5, and 6), pull-ups of all sizes, diaper wipes, diaper rash cream, baby wash, baby shampoo, baby lotion, baby powder, baby nail clippers, bottles, bottle brushes, sippy cups, baby formula (all brands, types, and sizes), baby food/baby cereal, baby spoons, baby forks, and pacifiers. The coordinators will also accept gently used baby gear such as swings, cribs, strollers, etc. as well as clothing and shoes for newborn to adult sizes. Dave Morgan, charity bingo volunteer and lodge member, said the baby pantry provides items such as clothes, toys, swings, cribs, strollers, as well as head to toe baby items including shampoo, combs, brushes, socks, shoes, etc. to families in need. 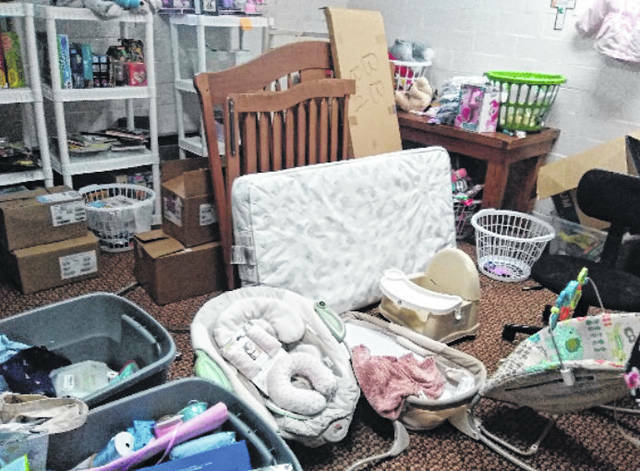 The baby pantry has been in action for six years now, Bree Ramey member of the Mason County Family Resource Network (FRN) and Jessica Legg have coordinated this program through the Bellemead United Methodist Church in Point Pleasant. The baby pantry is open every month on the second Monday from noon-2 p.m. and on the fourth Monday from 5-7 p.m. as well as in any emergency situation anytime. Mason and Jackson county families are eligible to receive baby items and clothing, families from Ohio and other West Virginia counties are eligible for clothing only. The lodge has been hosting special charity bingo nights on the second Monday of each month for local organizations, programs, schools, or individuals in need. The last charity bingo night was held for the Mason County Homeless Shelter to help them raise funding to help with the purchase of land to build a new facility. Morgan reported the total raised was $2,235 and the donations of supplies was approximately worth $1,365, totaling over $3,500. He said he still has individuals giving donations towards the shelter’s monetary goal of $40,000 which should make the total more than $2,500 in cash.